I didn’t grow up believing in Santa Claus, the Easter Bunny or the Tooth Fairy. There was no leaving cookies and carrots out for Santa and his hungry reindeer on Christmas Eve. I didn’t awake at Easter anticipating the search for chocolate eggs that a big furry visitor had hidden. As for the tooth fairy, she didn’t visit till I was at least eight when we migrated to Australia. By then I was old enough to know better and while I happily accepted coins in return for the last of my baby teeth, I knew deep down that a fairy wasn’t the one providing the compensation. None of these things are anything to be sad about as these are western concepts that weren’t part of a typical Hindu Indian childhood. We lived in Mumbai then, or Bombay as it was called at the time. My parents made sure there was no shortage of wonder in my life and so there was no sense of deprivation. I was an only child with a quirky imagination and they each had their unique ways of entertaining me. My mother was then a stay-at-home-mum, and as for many kids who have that luxury, she lost some of her authority come nightfall. So it was my dad who would come home from the daily grind to his duty of coaxing me to eat the healthy dinner that my mum had prepared. Luckily he too had quite the imagination and sitting at our Formica table in our little flat, he would find a way to transform the contents of my plate into something a fussy six-year-old would find fascinating. Rice, yoghurt, curries and sambhar would be carefully piled into an exotic looking arrangement with an equally exotic name to pique my interest. Dad’s skills as an engineer were never so challenged as they were when he constructed these elaborate creations that gave a new meaning to playing with one’s food. The whackily christened Auburi Biselari Kuselari was one such creation, made up of whatever was on my plate and with a name that was entirely conjured up in my dad’s mind. I like to think it is more a testament to my dad’s creativity and not a reflection of my own gullibility that this was a tactic which worked very well indeed. Dad had another trick up his sleeve, and not just in a metaphorical sense. Wanna see some magic? He would ask. Now what child says no to that? He would wave his hands around in the air, click his fingers, mumble some magicky sounding mumbo jumbo. With spectacular pomp, dad would make a fist, wave his other hand over it and turn it over to reveal a treat as if materialised from the air. And amazingly in his palm there would be a 5-star chocolate bar or a little pack of Gems (India’s answer to M & M’s) or a wedge of Amul cheese in its foil wrapping. Dad knew just how to enthral and impress his little girl. The Sweet Swap wasn’t quite the same as my dad’s wizardry, but it still involved packages of sweets appearing, as if by magic, on my doorstep. The inaugural event involved food bloggers from all of Australia and was put together by two lovely bloggers; Sara of Belly Rumbles and Amanda of Chewtown. Not only did the event raise funds for the charity organisation Childfund Australia, but it served to connect food nerds from all over the country, a real bonus for a newbie blogger like yours truly. The basic gist of it was that each blogger was matched with three other bloggers. We were instructed to make three batches of the same sweet and post them off to our matches. In turn, we received three surprise bundles of sweets from the bloggers that we were matched to. 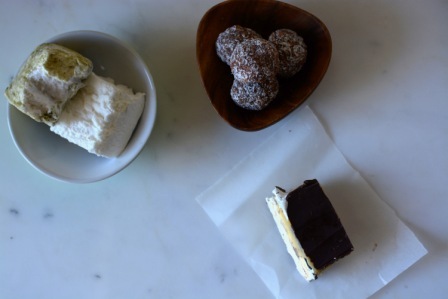 Now what could be better than receiving homemade goodies in the mail? Over the course of the week, I delightedly received firstly some scrumptious Irresistaballs by Tara from vegeTARAian, followed by the heavenly, goodbye-diet, Snickers Bars courtesy of Cassandra from Food Is My Friend. The last package contained some cloud-like Green Tea and Lemon Sherbet Marshmallows from Ed at Yaya’s Yumyums. As for me, I decided to try and dabble in some low-fructose treats. A little while ago, one of my colleagues, Maria, gave me a recipe for some seriously addictive bonbons that she had brought in to share. After a few tweaks, I came up with a version that had a fructose-free middle and a coating of dark chocolate. These bonbons have an incredible texture, with ingredients that feel really substantial in the mouth. The bitterness of the dark chocolate beautifully cuts through the sweet nuttiness of the filling. Remember that almond butter we made a few weeks ago? Well, you probably didn’t need a way of using it up, but if you did, this is one. These beauties are super easy and no-bake, which means you could easily get the kiddies involved, as long as an adult is handling the molten chocolate. They also make a great gift and evidently survive well in the postal system. These bonbons landed on the doorsteps of Emily of Hold the Peas, Muppy of Muppys and as nervous as I was about sending chocolate treats that I made to a professional sweet-maker, John of Perfection Chocolates. Blitz the walnuts in a food processor until a very chunky meal is achieved. Place in a large mixing bowl and add all the other ingredients apart from the chocolate. Start with 2 tbsp almond butter and add more later if the mixture is too dry. Mix with a wooden spoon until it is a sticky, even mixture. Oil your hands with a little coconut oil or a neutral oil. Roll the mixture into balls that are a little smaller than a cherry tomato. Spread out on a tray and place in the fridge for at least an hour. Melt the chocolate using your preferred method- I like to use a Bain Marie. Drop the balls into the molten chocolate two or three at a time. Use two teaspoons to roll each ball in the chocolate until completely covered. At this point, I sprinkled about half of them with desiccated coconut. Place the balls on a grease-proof paper lined tray and return to the fridge. Refrigerate for at least 2 hours. You can substitute any other nut butter for the almond butter. 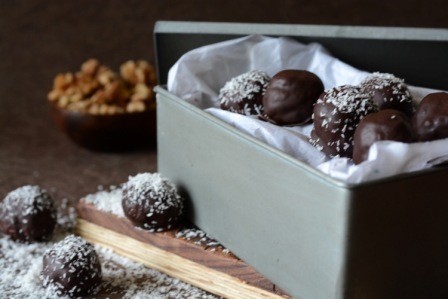 To make these completely fructose-free, you could use fructose-free chocolate which is sweetened with glucose or Stevia, and vanilla powder instead of extract. Of course, if you are happy to embrace the fructose, you can substitute golden syrup for rice syrup and use any chocolate you like. these look delicious – and the sweet swap sounds wonderful! Oh it was so much fun Sarah! Awww thanks Muppy…..and you are most welcome! Glad you liked them Emily. 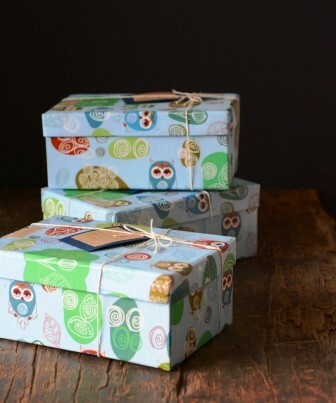 These look gorgeous Deepa and I just love your packaging! I love this story! These look so yum and it’s so great that they are fructose free; total necessity after the Sweet Swap. Thanks Alex! Glad you enjoy reading then as much as I love writing them. Yeah these would be perfect for you. you did a great job. your chocolate looked well tempered and the bon bon flavour was just right. if you ever need any advice contact me anytime. i really enjoyed receiving your parcel. What a gorgeous story, loved it. 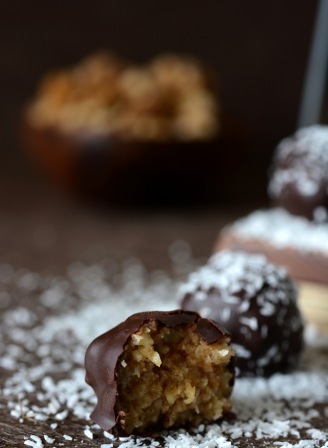 Your nutty bonbons look divine! Thank you Sara! It’s one of my favourite stories. Lovely photos, so moody! 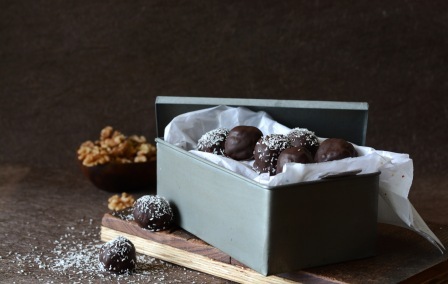 You did such a great job coating your balls in chocolate, they look so neat (yet wonderfully inviting). I absolutely loved reading the story about your dad and his creative trickery! I’m delighted The Sweet Swap reminded you of him. It definitely was old school getting treats in the mail. Thank you so much for being a part of the event this year. Thanks Amanda, I’m glad you liked it. The sweet swap was such a wonderful experience and so inspiring on many levels. You and Sara did a brilliant job. 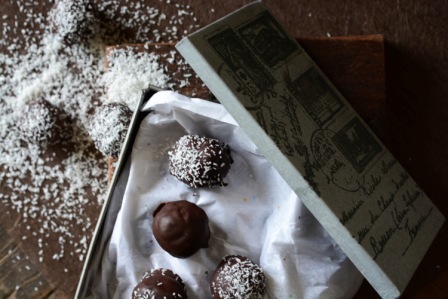 These look amazing.And sounds like Dad was the perfect lolly fairy! Haha he sure was Helen! 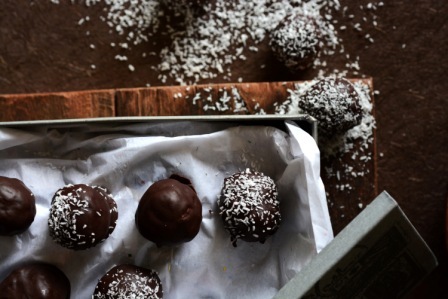 Gorgeous, I love anything with chocolate and coconut so I am sure these went down a treat! Thanks Natasha. Its one of my favourite childhood memories.